Letter of Credit (L/C) can be defined as a Credit Contract whereby the buyer’s bank is committed (on behalf of the buyer) to place an agreed amount of money at the seller’s disposal under some agreed conditions. Since the agreed conditions include, amongst other things, the presentation of some specified documents, the letter of credit is called Documentary letter of credit. The uniform Customs & Practice for Documentary Credit (UCPDC) published by International Chamber of Commerce (1993) Revision; publication No. 500 defines Documentary credit. Any arrangement however named of descried, whereby a bank (the issuing bank) acting at the request and on the instructions of a customer (the Applicant) or on its own behalf. Is to make a payment or to the order of third party (the beneficiary, or is to accept and pay bills of exchange (Drafts) drawn by the Beneficiary or. Authorizes another bank to negotiate against stipulated documents (s) provided that the terms and conditions are complied with. Revocable Credit: A revocable credit is a credit which can be amended or canceled by the issuing bank at any time without prior notice to the seller. Irrevocable Credit: A revocable credit constitutes a definite undertaking of the issuing bank (since it can not be amended or canceled without the arrangement of all parties thereto), provided that the stipulated documents are presented and the terms and conditions are satisfied by the seller. An irrevocable credit can be either confirmed or unconfirmed depending on the desire of the seller. This sort of credit is always preferred to revocable letter or credit. Sometimes, letter of credits are marked as either with recourse to drawer or without recourse to drawer. Revolving Credit: The revolving credit is one which provides for restoring the credit to the original amount after it has been utilized. How many times it will be taking place must be specifically mentioned in the credit. The revolving credit may be either cumulating or non cumulative. Transferable Credit: A transferable credit is one that be transferred by the original beneficiary in full or in part to one or more subsequent beneficiaries. Such credit can be transferred once only. Fractions of a transferable credit can be transferred separately, provided partial shipments are not prohibited. Back to Back Credit: The back to back credit is a new credit opened on the basis of an original credit in favor or another beneficiary. Under to back to back concept, the seller as the beneficiary of the first credit offers it as security to the advising bank for the issuance of the second credit. The beneficiary of the back to back credit may be located inside or outside the original beneficiary’s country. Anticipatory Credit: The anticipatory credits make provision for pre shipment payment, to the beneficiary in anticipation of his effecting the shipment as per L/C conditions. When the clause of the credit authorizing the negotiating bank to provide pre-shipment advance to the beneficiary is printed/typed in red, the credit is called Red Clause letter of Credit. Under the above-mentioned clauses, the opening bank is liable for the pre shipment advances made by the negotiated bank, in case the beneficiary fails to repay deliver the documents for negotiation. There are a number of parties involved in a L/C and the right & obligations of the different involved parties also differ from each other. Importer/ Buyer: are the person who request /instruct the opening bank to open a L/C. He is also called Opener of Applicant of the credit. Opening/Issuing Bank: is the bank which opens/ issues a L/C on behalf of the importer. It is also called the importer’s Bank. Exporter/Seller/Beneficiary: is the party in whose favor the L/C is established. Advising/ Notifying Bank: is the bank through which the L/C is advised to the exporter. It is a bank situated in the exporting country and it may be a branch of the opening bank or a correspondent bank. It may also assume the role of confirming and/or negotiating bank depending upon the conditions of the credit. Confirming Bank: is a bank which adds its confirmation to the credit and it is done at the request of the issuing bank. The confirming bank may not be the advising bank. Negotiating Bank: is the bank which negotiated the bill and pays the amount to the beneficiary. It has to carefully scrutinize the documentary credit before negotiation in order to whether the documents apparently are in order or not. The advising bank and the negotiation bank may or may or may not be one and the same. Some times it can also be the confirming bank. Paying/ Reimbursing Bank: is the bank or whom the bill will be drawn (as per conditions of the credit). It is nominated in the credit to make payments against stipulated documents complying with the terms of the credit. It may or may not be the issuing bank. Details regarding the rights and obligations of the different parties involved in the documentary credit operations may be had from UCPDC. The following five major steps are involved in the operation of a documentary letter of credit. 1. Issuing a Letter a Credit: Before issuing a L/C the buyer and seller located in different countries, concludes a ‘sales contract’ providing for payment by documentary credit. As per requirement of the seller, the buyer then instructs the bank- the issuing bank- to issue a credit in favor of the seller (beneficiary). Instruction/Application for issuing a credit should be made by the buyer (importer) in the issuing bank’s standard form. The credit application which contains the full details of the proposed credit, also serves as an agreement between the bank and the buyer. After being convinced about the necessary conditions contained in the application form and sufficient conditions to be fulfilled by the buyer for opening a credit, the opening bank then proceeds for opening the credit to be addressed to be beneficiary. 2. 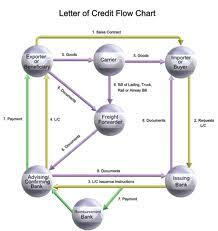 Advising a Letter of Credit: Advising through a bank is a proof of apparent authenticity of the credit to the seller. The process of advising a credit consists of forwarding the original credit to the beneficiary to whom it is addressed. Before forwarding the advising bank has to verify the signature (s) of the officer (s) of the opening bank and ensure that the terms and conditions of the credit are not in violation of the existing exchange control regulations and other regulations relating to export. In such act of advising, the advising bank does not undertake any liability. 3. Amendment of Credit: Parties involved in a L/C, particularly the seller and the buyer can not always satisfy the terms and conditions in full as expected due to some obvious and genuine reasons. In such a situation, the credit should be amended. In case of revocable credit, it can be amended or canceled by the issuing bank at any moment and without prior notice to the beneficiary. But in case of irrevocable credit, it can neither be amended nor canceled without the agreement of the issuing bank, the confirming bank (if any) and the beneficiary. 4. Settlement: Settlement means fulfilling the commitment of issuing bank in regard to effecting payment subject to satisfying the credit terms fully. This settlement may be done under three separate arrangements as stipulated in the credit. i) Settlement by payment: Here the seller presents the documents to the paying bank and the bank then scrutinizes the documents. If satisfied the paying bank makes payment to the beneficiary and in case this bank is other than the issuing bank then sends the document to the issuing bank. If the issuing bank is satisfied with the requirements, payment is obtained by the paying bank from the issuing bank. ii) Settlement by Acceptance: Under this arrangement, the seller submits the documents evidencing the shipment to the accompanied by the draft drawn on the bank (where credit is available) at the specified tenor. After being satisfied with the documents, the bank accepts the documents and the draft and if it is a bank other than the issuing bank, then sends the documents to the issuing bank stating that it has accepted the draft and at maturity the reimbursement will be obtained in the pre-agreed manner. iii) Settlement by Negotiation: This settlement procedure starts with the submission of documents by the seller to the negotiating bank accompanied by a draft drawn on the buyer or any other drawer, at sight or at a tenor as specified in the credit. After scrutinizing that the documents meet the credit requirements, the bank may negotiate the draft. This bank if other than the issuing bank, then sends the documents and the draft to the issuing bank As usual reimbursement will be obtained in the pre-agreed manner. Forwarding: Negotiating Bank sends the shipping documents to Issuing Bank with the cover of Forwarding Letter mentioning the details of encloses. Bill of Exchange: According to the section 05, Negotiable Instruments (NI) Act-1881, A “bill of exchange” is an instrument in writing containing an unconditional order signed by the maker, directing a certain person to pay [on demand or at fixed or determinable future time] a certain sum of money only to or to the order of a certain person or to the bearer of the instrument. It may be either at sight or certain day sight. At sight means making payment whenever documents will reach in the issuing bank. Invoice: Invoice is the price list along with quantities. Several copies of invoice are given. Two copies should be given to the client and the other copies should be kept in the bank. If there is only one copy, then its photocopy should be kept in the bank and the original copy should be given to the client. If any original invoice contains the custom’s seal, then it cannot be given to the client. Packing List: Packing list is the letter describing the number of packets and there size. If there are several copies, then two copies should be given to the client and the remaining should be kept in the bank. But if there is only one copy, then the photocopy should be kept in the bank and the original copy should be given to the client. Bill of Lading: Bill of Lading is the bill given by shipping company to the client. Only one copy of Bill of Lading should be given to the client and the remaining copy should be kept in the bank. Certificate of Origin: Certificate of origin is a document describing the producing country of the goods. One copy of the certificate of origin should be given to the client and the remaining copy should be kept in the bank. But if there is only one copy, then the photocopy should be kept in the bank and the original should be given to the client. Shipment Advice: The copy mentioning the name of the insurance company should be given to the client and the remaining copies should be kept in the bank. But if only one copy is given, then the photocopy should be kept in the bank and the original copy should be given to the bank. PSI (Pre-shipment Inspection Certificate): It is a confirmation that the goods have been inspected prior to shipment and found as per requirement of the client (importer) and as per L/C. It is generally issued by a neutral organization. It is also called CRF (Clean Report of Findings). Insurance: International trade is very much risk ridden. So it is necessary to insure the goods against the risk of loss or damage. Insurance is a contact whereby the insurer is undertaking to indemnity the assured to the agreed manner and extent against fortuitous losses. Insurance is, therefore, a contract of indemnity. The document is which contract of indemnity (or, insurance) is embodied is called a policy. The man 9od firm) who undertakes to insure s called insurer. When the insurer will subscribe his name in the policy then he will be called an underwriter. The owner of the goods (which are insured) is called assured. The thing which is assured has in the subject matter of insurance. The interest which the assured has in the subject matter is known as his insurable interest. The payment for which insurer undertakes to indemnity is termed as premium. This form is prepared for maintaining account of the money, which goes out side the country for the purpose of payment. This form is required by Bangladesh Bank. It is an application for permission under 4/5 of the Foreign Exchange Regulation Act, 1947 to purchase foreign currency for the payment of import. Original copy for Bangladesh Bank. Duplicate copy for authorized dealers. It is issued for processing Exchange Control Copy of bill of entry or certified invoice. Triplicate copy for authorized dealers’ record. Quadruplicate copy for submission to the bank in case of imports where documents are retired. Indent copy / proforma invoice. Overall Banking System of Jamuna Bank Limited. How to Islami Bank Bangladesh Maintain Investment Operations?